Derby Razor Blades are perforated, hardened and ground by utilizing most advanced equipment. Cutting edges are deposited with CHROMIUM- CERAMIC, TUNGSTEN AND PLATINUM by advanced Spluttering Equipment for optimum EDGE STRENGHT thus longer shaving life. Coated with a polymer for optimum shaving comfort. From beginning to end, all Derby Razor Blades are subjected to severe Quality Control Inspection at every stage of manufacturing processes by utilization of unique quality control equipment. 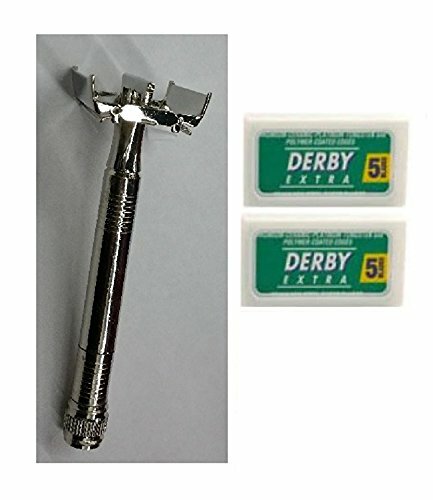 Derby Extra Double Edge Blades, 5 ct One of the smoothest-shaving and most durable blades available, a premium stainless/platinum blade. If you have any questions about this product by Derby, contact us by completing and submitting the form below. If you are looking for a specif part number, please include it with your message.